The Lab Coats keep telling us that the mercs need more firepower. There was a bunch more they kept babbling on about, but we tuned that out once we saw these new specimens for the Firebugs out there. Now they haven’t exactly been “field tested”, or tested at all really (unless you count cute furry, irradiated animals in the backwoods of Cornwall). But that’s where you come in! Have you ever wanted to microwave something clear across the room, or within eyesight really? 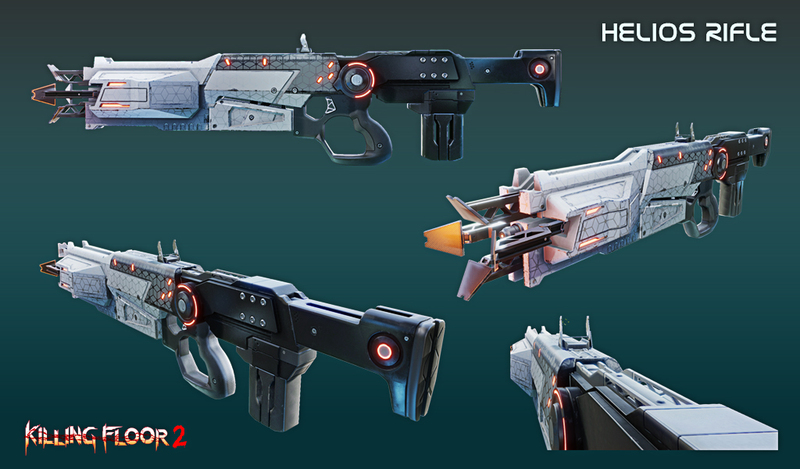 Look no further than the new Helios Rifle (patent pending)! This baby fires balls of plasma in full auto or three round burst that we can (mostly) guarantee will cook your enemies from inside out and keep going to cook their friends too! Did we mention we needed help testing that guarantee before wider rollout, just make sure we have an updated copy of your HZ-507 testing forms, notarized in triplicate, on file before handling, or being anywhere near this weapon. Was the sound of rounds built on the “science” of dark magic known as “microwaves” not enough for you? Did you want to know what would happen if somebody took that tech and took it to 11? Well lucky you, so did the lab coats back in R&D! She fires energy bolts down range, and any entrepreneuring user can choose to “overcharge” the Killerwatt and send a beam of, what did they call it? Tesla destruction down range, destroying all in its path, making you, the new king of the battlefield! Something something harmful side effects*. Please don’t visit a doctor, as you may kill them via exposure to your newly irradiated body - but who needs them anyway when you are in the line of work that you are? *May cause internal hemorrhaging, spontaneous combustion, paranoia, disillusion of grandeur, low blood pressure, restless leg syndrome, and extended stretches of homicidal mania. Call your nearest Horzine physician if effects, or continued life, last for more than 4 hours. Last edited by Yoshiro; 02-01-2019, 03:23 PM. Woah sweet. Hope these are good enough to use full time. I love me some fancy future guns, but a lot of them are not strong enough to use beyond the novelty. GL Balancing them cause they look amazing. The first weapon looks like a small carbon copy of the microwave gun. Is this weapon intended to replace it or is it reserved for something else? I'm always willing to bet it's going to be crossed with the firebug and commando. As for the second gun, some of us always wanted to use a tesla cannon, and here it is! Judging from it's design, it looks like another SS weapon. Cool! But I hope the Husk Cannon is also getting a serious re-work. Otherwise it should just simply be removed imho. Hu ? From what i understood, it will more be like a laser assault rifle (a bit like plasma gun in Doom), so i think not it will be a copy of microwave gun. That's really great, i wanted some guns like this for a long time now. I hope the first gun will be cross-perk with commando, and the second gun will be cross-perk with sharpshooter. Last edited by Spych0pat; 02-01-2019, 03:12 PM. Personally, I really like the Husk Cannon as a firebug "fleshpound killer". The weapon that I have never seen a use for (except for when it was first released and OP) is the microwave gun. Sure it kills big zeds, but is not ammo efficient whatsoever. 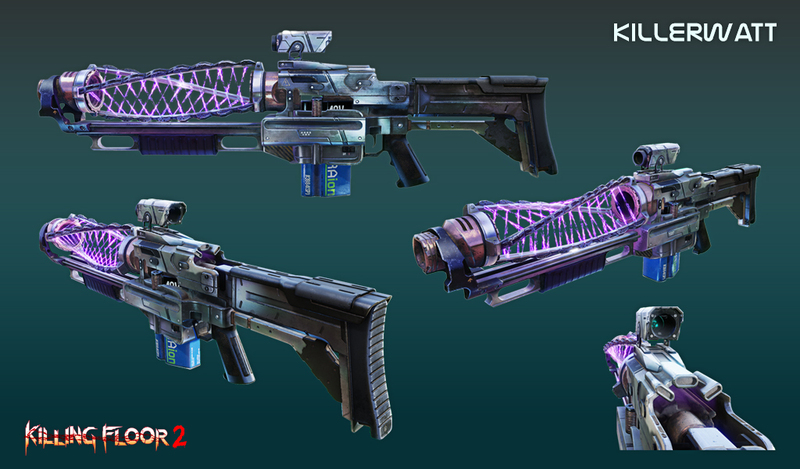 I am deeply looking forward to the Helio rifle, since the microwave incapacitation effect is so cool! Firebug only, and Killerwatt is for Survivalist. It still looks like a smaller microwave gun. And we all know that particular weapon is not seen use in ages after it was nerfed pretty hard. Also, I'll like for the Tesla Canon to be restricted to just Sharpshooter because Commando has enough weapons. All that commando needs right now is weapon weight rebalance, as l85 and mkb make no sense in their weight category right now, and AK has no real reason to be used currently. "This baby fires balls of plasma in full auto or three round burst"
Tell me how that sounds similar to the microwave gun ? I'm pretty excited to see more new weapons and I have a quick question, do you guys plan to release any new characters? Very cool. I think we have almost full arsenal for potential scientist perk... right? I proposed the zapper long ago, I don't understand why you'd force this energy crap down the bug's throat. There's a whole lot of potential for an energy-focused perk, and it makes literally zero sense to give the firebug a friggin' plasma rifle.